I've heard it from a Hollywood orchestrator, who used it in one of the scores, and it was, as above, ˈɪlən. The word is also on Forvo (three pronunciations, two from Ireland) and Irish Culture and Customs website. As an Irishman who follows traditional Irish music, I can assure you that it's universally pronounced 'ɐlən in the North of Ireland, which would be 'ɪlən (or possibly 'ɪlɪn) in RP. So it would be anglicised illen. 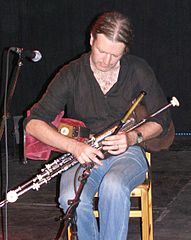 In Irish the pipes are called píoba uilleann, pronounced pʲ'iəba 'ɪlʲɐn in the Northern dialiect, which would regularly yield the anglicisation above. I'm not sure if a different pronunciation is used in the South. They speak a different dialect of English, and also a different dialect of Irish down there. But the Wikipedia article given 'ɪlən as the English pronunciation, which looks correct to me. I've never heard 'u:lɪən and I can't see how anyone could get such a pronunciation, other than by interpreting the spelling uilleann as an English word. Irish orthography is radically different from those of other European langages and I can see how the initial silent U would confuse. I don't regard either as 'correct', which doesn't matter as I never pronounce the word nowadays without explaining and describing the instrument. I have read that Anglicised union pipes is or has been used in Ireland alongside the authentic name. In Irish the pronunciation is [ˈɪlʲənʲ] and in Hiberno-English both [ˈɪljən] and [ˈɪlən] are heard. The pronunciations with [ʊ] are incorrect, as are any pronunciations with a long vowel [uː] or [iː] in the first syllable. The modern nominative in Irish is uilleann, gen. uillinn. when Shakespeare in The Merchant of Venice speaks of 'woollen bagpipes' he probably means the Uillean pipes. Once upon a time I mixed with and spoke with people who knew and could use the authentic pronunciation. They never did so in my hearing because the pipes was always unambiguous in the context. I'm not in the least surprised that neither of my pronunciations are authentic. But that's not what John asked for. The only time I've heard Cruithne (/ˈkɾˠɪ(h)nʲə/ in Irish) pronounced in English it was /kruˈɪθnə/ (or /kruˈɪθni/, can't remember for sure). My bet is that the speaker had never heard that word before and just guessed. (Something similar would explain why the four possible pronunciations of ether in recordings of "Comma Gets a Cure" don't seem to correlate with anything else, and why a sizeable fraction of speaker correct themselves wrt the pronunciation of the E (but none that I've heard so far does wrt the TH, who knows why). I missed John's reference to Union in the Wikipedia article. The argument there rests on the fact that the first written use is union. It seems to me much more likely that the corruption was from uillean to union before either was written down. 'Elbow pipes' seems a perfect term. Certainly, that's what my Claddagh sleevenotes say. The argument cited in Wikipedia rests on the assertion that 'the instrument did not exist as such' in Shakespeare's time. But that wouldn't preclude some predecessor instrument having the same name. Simpler 'elbowed' (bellows driven) instruments are still around, and not only in Northumberland. I would say and hear [ˈɪlən] in Munster English. Mapping the broad/narrow distinction of Irish consonants to Hiberno-English ones is fraught. The easiest mapping is for s: /s/ broad and /ʃ/ narrow. I guess the various l forms provides the widest menu of possibilities. @mollymooly: Yeah the s is one of he few letters with a straightforward mapping of broad and slender sounds in their anglicisation. But in the North we treat t and d in a similar way: Broad, they're t and d; slender, they're tʃ and dʒ. ['ɪlən] is how I've always pronounced it; this is also what's given in T. P. Dolan's Dictionary of Hiberno-English. Uilleach means angular or having corners; uilleannach means elbowing, nudging, or having prominent elbows. I will say 'ɪlən from now on. I loved John's link to Seamus Ennis, so I looked for Leo Rowsome online. There are several sound recordings and this remarkable film clip with Rowsome playing and a delightful counter-image to the then future that is Riverdance. I pronounce it like "million" (but without an m, of course). I too say ['ɪlən]; the oddest pronunciation I have heard is ['wɪljəm]. Mapping the broad/narrow distinction of Irish consonants to Hiberno-English ones is fraught. [...] I guess the various l forms provides the widest menu of possibilities. Army, by N do you mean the velar nasal ŋ, or the uvular nasal ɴ? I cannot read what's in brackets because of font problems. @John Cowan: neither. This use of N is a convention used for Goidelic languages to indicate something "fortis". may be of interest (though focussed more on Scottish Gaelic than Irish). I'm afraid I don't know how to use phonetic transcription, but I do take part in folk music events in Wales. I've always heard this instrument referred to as "ooh-lee-ann" pipes. I must have been sleepy when I made my first post above, because the nominative uilleann is pronounced [ˈɪlʲənˠ] not [ˈɪlʲənʲ]. Sorry. I've heard it with an initial i sound, and I'm not sure I've ever heard it with something resembling a u sound, or even a "wi"-like initial vowel. (No IPA for me, because I'm hopeless with the vowel distinctions, and when I start trying to distinguish, I start altering what I'm saying...) I'm pretty sure I've heard the second vowel as both "e" and "ye", though I don't recall the frequency well. I'd pronounce it as "illian" if I had occasion to say the word. On the other hand, I'm in California, and I suspect that out here we butcher Gaelic pronunciations even more than do other Americans.